Ray Bradbury will always be known as one of the City of Angels most famous native authors. Similar to our most well-known poet, Charles Bukowski, Bradbury graduated from Los Angeles High School. They actually graduated one year apart: Bradbury in 1938 and Bukowski in 1939. Both of these storied L.A. authors were recently honored in the Los Angeles High School Library with their words inscribed on the freshly painted walls. 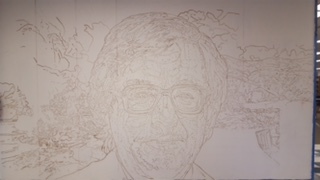 This commemoration was culminated with a mural of Ray Bradbury painted on a large wall next to the library’s front entrance. 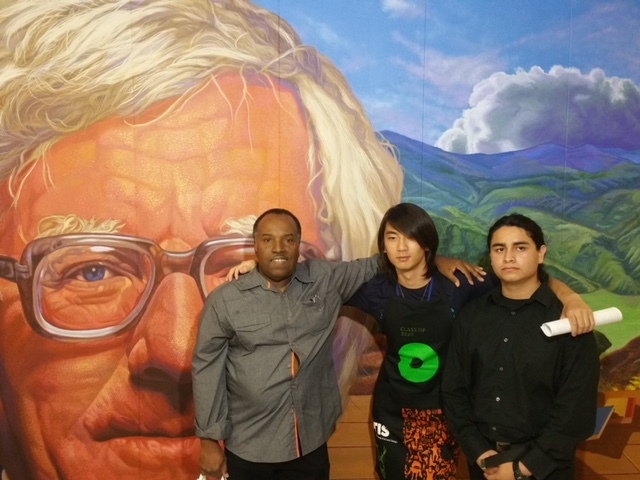 Bradbury was painted by the legendary Los Angeles artist Richard Wyatt Jr. What makes the mural even more significant is that Wyatt mentored a team of high school student artists who assisted him in the process. The unveiling of the new mural on April 14, 2016 was a standing room only event that not only reenergized the library at Los Angeles High, it reinvigorated the entire school. This essay will spotlight the Bradbury mural, Richard Wyatt Jr., the team of student artists and the librarian and group of teachers who all worked together to make this incredible project a reality. Considering that Ray Bradbury had attended the school and that the library was in need of a facelift, all of the pieces fit perfectly. Moreover, Hanson remembered that she had met Wyatt a few months earlier and decided to email him. After a quick exchange of emails, Wyatt visited Los Angeles HS in December 2015 to see the library and by the end of January 2016, the ball was rolling. Richard Wyatt loved the project right from the start because he has always enjoyed libraries, painting cultural figures, working as an educator and mentoring youth. “I was nine years old when I fell in love with art in a library,” says Wyatt. Wyatt is a lifelong Los Angeles resident that has painted dozens of murals across Southern California including the large mural at Union Station, “City of Dreams, River of History,” the Nat King Cole mural on the south side of the Capital Records Building in Hollywood, a mural at White Memorial Hospital in Boyle Heights, a mural at the Watts Towers and one at the Ontario Airport among many others. Wyatt is also known for being the co-creator of the Robert F. Kennedy Inspiration Park along with his longtime colleague, the artist May Sun. Over the years, he has taught at universities like UC Irvine and the Otis College of Art and Design and mentored youth at the Watts Towers Art Center. Wyatt has had student painters apprentice with him in the past on many projects and his own art career began in the late 1960s, early 1970s with him apprenticing as a teenager at several sites including a UCLA Art summer camp, the Studio Watts Workshop, the Chouinard Institute and Otis College. Early in his own career, Wyatt had great teachers like George Evans, so he has always loved to mentor others like how he was taught. By the time he was 17 in 1972, he was selected to be a part of the Los Angeles County Museum of Art’s “Panorama of Black Artists” exhibition. Shortly after this, Wyatt studied at UCLA and he started as a working artist right off the bat in his early 20s. He has always believed in giving back to the community and this project allowed him to do just that. “This project was right on time for me,” Wyatt says. Wyatt always researches his subjects extensively before he paints them and he was very enthusiastic about this project because he is a fan of Ray Bradbury. Wyatt loved Fahrenheit 451 and he was excited that he could honor Bradbury in the library at the great author’s alma mater. 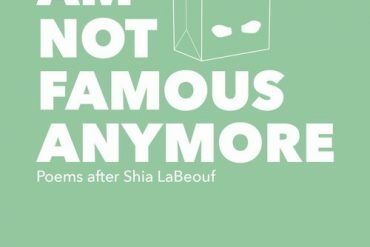 While talking with Wyatt about this project, he turned me on to a documentary about Bradbury’s life and also informed me that Bradbury had been influenced by John Steinbeck. Another great fact he shared was that Jimi Hendrix was a fan of science fiction and especially books by Ray Bradbury. Librarian Tikisha Harris says that they held afterschool workshops with the students and Wyatt to discuss Bradbury, Fahrenheit 451, artistic concepts and all of Wyatt’s previous work. One of the ideas that was most important was how big of a role books played in the life of Ray Bradbury. Bradbury is one of the most successful autodidacts of all time. Though Bradbury never went to college, he read thousands of books from his early youth on. Bradbury always felt very connected to places like the school library and the Central Library in Downtown Los Angeles. Moreover, Bradbury also wrote much of Fahrenheit 451 at UCLA on a typewriter in their Powell Library. Wyatt says that after all of his research on Bradbury and these discussions, the concept of the mural came together quite quickly. The project officially started on February 16th when Richard Wyatt Jr. came to the library to start painting. Wyatt mentored a team of students that included Patrick Koh, Ronald Mendez, Yin Ling Li, Julian Nava and Rosaura Lopez among several others. One of his biggest helpers was Patrick Koh. Koh graduated from L.A. High in 2015 and has attended Los Angeles City College (LACC) over the last year. In his spare time between his classes at LACC, he was assisting one of his former teachers at his alma mater and one day when he visited the L.A. High campus library, Ms. Harris remembered Koh as a member of the book club and she also remembered his interest in art. The timing was perfect and she drafted him into the Bradbury mural project. Koh ended up making an invaluable contribution to the project working closely with Wyatt several times a week over a two month period. “This was an opportunity that I could not miss,” Koh says, “because I am learning from a master painter, so I was excited! It was such a huge honor to be working with a well-known muralist who has painted in so many places across Los Angeles.” All of this combined with the fact that Wyatt was doing this at the high school Koh graduated from, he thought it was too good to be true. He soon found himself painting with Wyatt on campus every chance he could get. The hands-on education energized him and Wyatt. Koh also spoke about his colleague Ronald Mendez. “Out of all the students,” Koh says, “Ronald worked on most of the areas that Mr. Wyatt wanted him to paint such as the fire before Mr. Wyatt put in the details, the river, the gold floors, a few books, and a small part of the face.” Koh and Mendez built a friendship in the process. “I remember how we would critique and comment on the others work like what we like and what should be added in,” Koh recalls. Wyatt, Koh, Mendez and the students ended up having a ball. “Time passed by very quickly every day when we painted,” Koh recalls. Wyatt and the students were so involved in the project that they did not ever want to leave the library. “An area that we worked on might have looked like we spent only 90 minutes,” Koh recalls, “but in reality, 3 hours have passed. Whenever it was time for the library to close for the day, it was the most unfavorable and hardest thing to do.” The entire project was finished within two months. Furthermore, Koh has not only created a lasting friendship with Richard Wyatt Jr. and Ronald Mendez, he is also excited because he will be transferring to the Otis College of Art and Design this fall with this experience under his belt. Librarian Tikisha Harris said that another inspiring feat the mural accomplished was that it got students to read Bradbury. In spite of her joke about their frequent Bernie Sanders remarks, “Eventually everyone was talking about the book,” she told me. “In the two months they were painting the mural, we had so many conversations about Ray Bradbury,” she exclaims. “This really became a community event.” Simultaneously, during the same time the mural was being painted, the rest of the library was also being remade. Teams of students from the woodshop class helped make new book shelves, quotes from authors like Bradbury, Bukowski and others were painted around the room and numerous small details were added to beautify the library’s appearance. 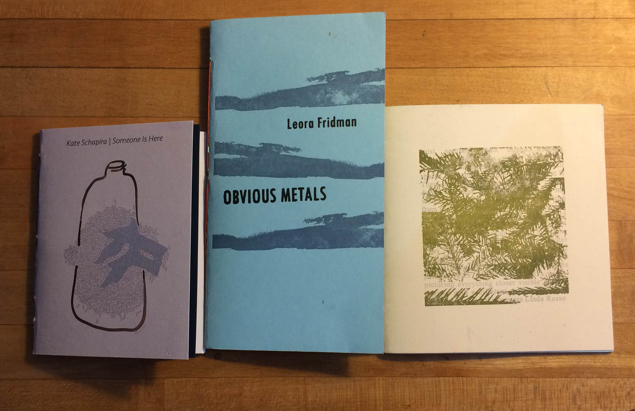 Harris is very grateful to the whole slew of students and a few local organizations that contributed materials, books and funds like the Department of Cultural Affairs, El Cholo and the Harrison Trust. Harris is also grateful to the school staff like her principal Dr. Yoon-Fontamilllas who gave the project the green light and her fellow teachers like Sonia Hanson and Laurie Lombardi who had taught students like Patrick Koh how to paint so well. Tikisha Harris told me that the entire project was very student-centered. Both Harris and Wyatt loved this because as Harris told me, “they learn the most when they take their education into their own hands.” Wyatt also told me that his biggest intention whenever he teaches or paints with students is, “to help students find their own voice.” The mural and new look of the library speaks for itself and corroborates with this. The Open House on April 14th where the mural was unveiled was a full house of spectators that included Ray Bradbury’s daughter, Susan Bradbury Nixon, political representatives from Congresswoman Karen Bass’s office and LAUSD board members like Dr. George McKenna. This project is the latest success in Richard Wyatt’s storied career. Nonetheless, as much success as Wyatt has had though, he deflected the attention and told me to really focus on the youth like Patrick Koh that helped him paint the mural. This symbolizes how altruistic he is and why he is one of Los Angeles’s greatest civic artists. Wyatt’s work was recently added to the permanent collection at the California African American Museum in Exposition Park. 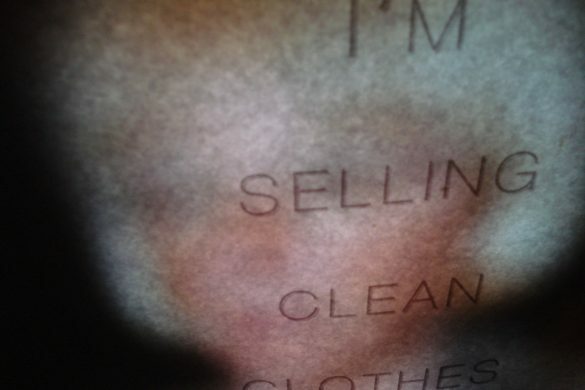 His work is now a part of the exhibit, “Reflections on the Self.” Considering that Wyatt has been one of the most prolific civic artists in Los Angeles for almost forty years now, it makes great sense for his work to be included at the museum. The collective team effort of Wyatt, Tikisha Harris and the students accomplished multiple achievements with this project. They reinvigorated their school, they remodeled the library, they got many students reading Ray Bradbury, they honored Bradbury himself and the students learned how to paint from a contemporary master. This project epitomizes community activism, the importance of the arts, the need for literacy and why collaboration is so important. Richard Wyatt Jr. told me that this is mural is one of his favorite projects in his 40 plus years of public art and librarian-teacher Tikisha Harris is ecstatic because it got the students excited about books and beautified the library at the same time. Words from the recent Los Angeles High alumni Patrick Koh affirm this. “This project gave me a new perspective of not only art, but also of the community,” Koh told me. “The whole time, I believed that this project was a school thing, but it turned out to be a public event, as many people, including Ray Bradbury’s daughter, attended the unveiling during the Open House on April 14th. This showed me that our actions and contribution may look small, but it does make a huge change in the community. From this project, I have not only learned more about painting and improving my skills, but also about individuality. He taught us to be free, original, a voice for the people. Mr. Wyatt always told me, ‘If you imitate someone, you become an echo and not a voice.’ Never before had I ever thought about the community of Los Angeles to this extent. All this could only happen because of the school, staff members, teachers, students, and Mr. Wyatt himself!” Patrick Koh’s sentiments are shared by all of the participants in this project. 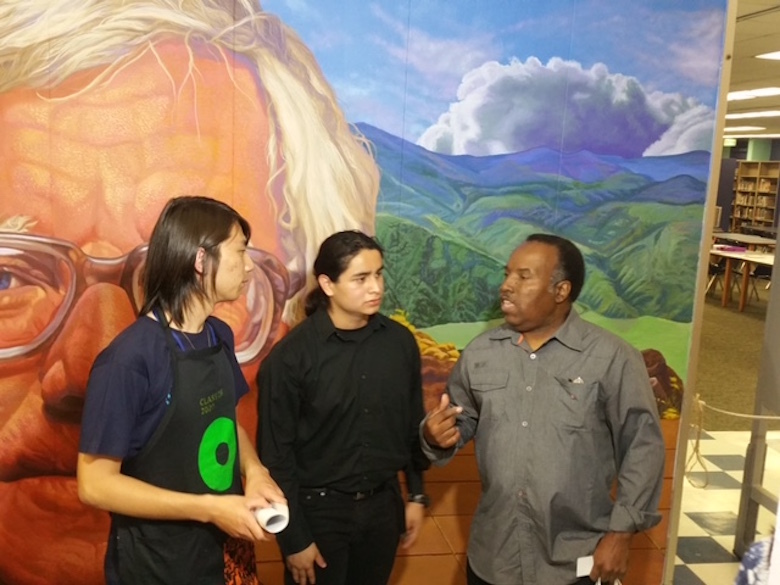 One month after the unveiling of the mural on May 13th, Tikisha Harris arranged for the whole team of students along with Richard Wyatt to attend the opening reception of a multi-media exhibition of work created by young people and adults participating in “The Big Read Program,” at the Gallery at the Mexican Cultural Institute of Los Angeles near Olvera Street. This exhibit featured artwork inspired by Bradbury’s Fahrenheit 451 and a special reading by Los Angeles Poet Laureate Luis Rodriguez. Prior to taking the students to the exhibit, Wyatt, Harris, a few of the teachers and over 15 students went to eat an early dinner at El Cholo and then to the art show. The management of El Cholo was so inspired by the whole chain of events leading up to the finished mural that they comped the meal for the group. I went to the restaurant and met the extended team of students. Needless to say, they were all very inspired and thrilled with the whole experience. A final word must be said about Ray Bradbury himself. After being born in Illinois, Bradbury landed in L.A. at 13 years old and lived the final 79 years of his life in Southern California before passing in 2012. In all of his interviews and talks he would always speak about the importance of books in his life and how determined he was to make it as a writer in spite of the odds. For his first four years after graduating from Los Angeles High School, he sold newspapers on the corner of Olympic and Norton, just a few blocks east of the school. Nonetheless though, when he was not working, he read countless books and wrote as much as he could. 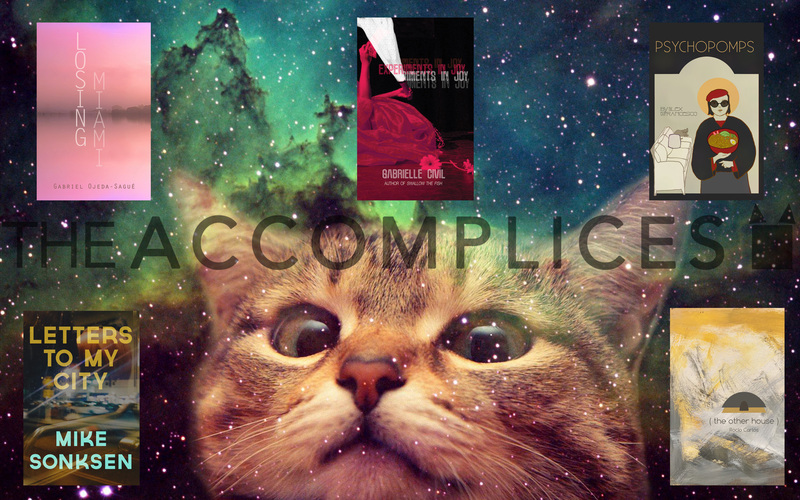 Literary distinction is indeed what Bradbury achieved. As the author of over three dozen books, and winner of countless awards, Bradbury came a long way from selling newspapers on Olympic and Norton and his time at Los Angeles High School. 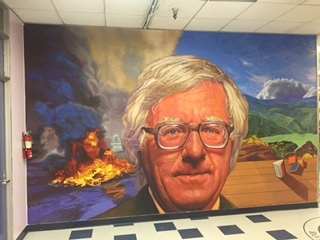 Nearly 80 years after he graduated, Bradbury would undoubtedly be thrilled that a mural honoring him painted by one of L.A.’s greatest artists and a team of students is on the school’s library wall inspiring and urging students to pursue their dreams and believe in their passion just like he did. Furthermore, as immortal as Ray Bradbury already is, this mural rightfully reinforces his legacy for the next generation of Los Angeles youth. 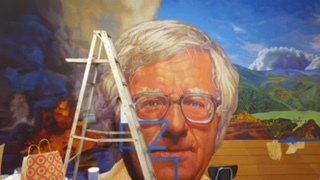 Thanks to this mural project, the fortunate students at Los Angeles High School will forevermore be blessed to walk into the school library and bask in the light of two masters: Richard Wyatt Jr. and Ray Bradbury. 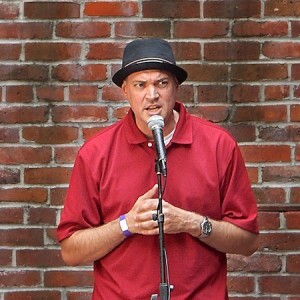 Mike Sonksen aka Mike the PoeT is a 3rd-generation Los Angeles native. Poet, professor, journalist, historian and tour-guide, his latest book Letters to My City was just published by Writ Large Press. He teaches at Woodbury University.